"It is my job to control many staff members and play the retail game with them. I have to have good control and create the business. I watched one of the staff members playing the game wrong and I saw this with my own eyes. She was going in the wrong direction of that game. I needed to guide her in the right direction so I stopped her game and made it clear for her to see what the right game was and the goal she had to get to and that she had to create this to get that goal. She smiled and I let her do it on her own. She immediately succeeded and I saw a great improvement in her. I was proud of myself for having good control and creating a cycle of action. I was even more happy that she created it on her own." 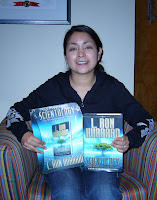 M.S., a professional tango dancer, completed Scientology: The Fundamentals of Thought Book Course. . He said, "This has improved my knowledge and understanding of everyday living. And how to work with other people. I would recommend this course to anyone!" "I bought this book in 2002- saved up for it for weeks because my friend Carter who is an auditor told me it was the book every preclear needed to have and that it would blow me away. Unfortunately I could never make it past the 3rd chapter so I was hung in a mystery as to what he was talking about. Now, with the new edition of the book I understand! This course rocked my world! I realized so many things that I wouldn’t know where to begin to explain it all. I can’t wait to do the auditing on myself which iscontained in the book. I want to share this information with everyone else by getting them through their Basics. LRH, you are a genius and I love you. Thanks for unveiling these secrets and making them simple."